PNGBlogs.com – One of the best ways to take away people’s land is to keep them dumb and stupid about land laws and land rights. Keeping people ignorant about land legalities also allows landowners to trick those who think they are buying land when they’re actually not. The only way we know of to sell land legally in PNG is to sell to the state. It may be possible under the law for natural born citizens to sell land to other natural born citizens but the way customary landowners are selling blocks of land around every city in PNG today is a scam if you think you now own a block of land. The law seems to point to the transaction as being a transfer of temporary rights to use the land, not actually to own it. Thus, the blockholders are not buying land. It is more like they are renting it. In nearly all cases, there are no legal papers to even establish that. Nearly every block of land in PNG that was customarily owned is likely to still be customarily owned. Without a clear lease agreement being signed by both parties, the customary landowners can kick you block holders off your blocks whenever they want. They win, you lose. That is exactly what worries our Prime Minister these days. He sees that customary landowners, going completely around the law, are managing to generate money off their land by “selling” blocks to citizens. The legal rights are all on the side of the customary landowners. Why would they bother to get fancy lease agreements drawn up if they don’t have to. They’re making money through these informal leases (which those who develop the blocks erroneously think are land sales, not land leases) without the paperwork. Good on them. Peter O’Neill and his foreign cronies don’t like it because the customary landowners may get too satisfied and comfortable with this informal system. The politicians, the foreign “investors” (they are actually “exploiters”) and the self styled wannabe land barons pioneered by lawyer Loani Henao want all this to stop because it’s too risky for any of them to enter into informal land lease agreements. To secure megabuck bank loans to develop other people’s land for their personal profit, they need formal lease agreements. That requires legal paperwork. That is why Peter O’Neill is scamming people again by telling them to register their land so that it can work for them. Many of the block selling customary landowners haven’t registered their land and as long as their are no disputes within their own group that the land belongs to them, that’s fine. They don’t need to register the land. Registering the land is a sneaky way of letting the government know who they can later charge land taxes to. If the registered landowner doesn’t have the money to pay the taxes, the government can easily structure things so that it confiscates the land for nonpayment of taxes. That is trick #1 to get people to register their land the way the PM wants. Trick #2 reason to get customary landowners to register their land is in order to attract them to enter into 99 year land leases for their land. When you lease land to someone else, you always still own the land but you normally loose all your rights to the land for that amount of time. You might even lose the right to walk on your own land. You are paid a rental for the lease which is supposed to be the compensation for your loss of land rights. The person or company that leases your land can make all the money they want or can manage and don’t have to give you 1 toea of their profit. This is because you have no rights on the land. Only they do. Of course, in 99 years, you can get back your land rights. Or can you? Remember that state owned land is often in the form of a 99 year lease. How many customary landowners have tried desperately and succeeded at getting back their land that the government took back in the colonial times? Many have tried and almost none have succeeded. Instead they always seem to be outmaneuvered by some kind of fat cat and a new 99 year lease agreement is set, with a pathetically low yearly rental arrangement for the customary landowners. In other words if you are a customary landowner who even one time are so stupid that you register your land then offer it for 99 year lease, you have sealed the sad fate of your people for an eternity. You lose the rights to your own land in exchange for a rental fee. You get the same rental fee every year regardless of whether those who leased your land only make K2 profit off your land or make K200 million profit. You become spectators on your own land. No matter how much you protest and complain about it, the law is on the side of whoever it was that leased your land. Your stupidity was in not understanding the law. Peter O’Neill wants all customary landowners to register their land so that the land grabbers know who owns what land. They will then know who to visit to whisper sweet words into the ears of those landowners. The landowners will be able to lease their land for 99 years once they have registered their land. That is exactly what the land grabbers want. Once the land grabbers have obtained a 99 year lease over a piece of land, the land belongs to them forever for all practical purposes. Once the land is grabbed by evil hands using the land lease method, it is nearly impossible for the customary landowners to ever recover their land rights. For eternity they will watch while others profit handsomely off the land that was once theirs. [Niugini Outlook is located at www.facebook.com/niuginioutlook All information on the site is accessible to you even if you do not have a Facebook account. On it you will find over 1,500 different posters and associated articles to browse through, far more than are advertised as being available on other FB sites. Join thousands of others and click that you ‘like’ the page so that you won’t miss any of the latest!]. Niugini Outlook is for anyone who loves Papua New Guinea. Our site contains news and views on hot topics affecting PNG today. 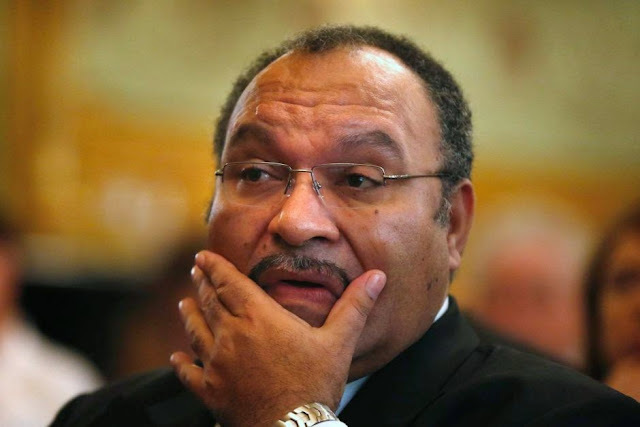 Our postings especially focus on the accelerating injustice, corruption and inequality that threatens to destroy PNG and its healthy development today. We try to offer some of the sharpest talk on social media because Sharp Talk seems to do better at motivating people to learn, remember, and develop into the kind of active participating citizens that true democracies require. Consider everything on Niugini Outlook to be an allegation, not established truth. Do not blindly accept anything you read on Niugini Outlook or anywhere else. Think about what you read and question and reach your own conclusions. We put out the allegations we receive in the hopes of attracting more information about the topic so we all come closer to the truth. Thanks to the outstanding PNG coconut wireless and relatively small PNG elite population, our postings seem to always become known by the public figures mentioned in our postings. Any people or businesses being accused on Niugini Outlook are only alleged to have committed the wrongdoing. We do not pretend to pass final judgement ever. However knowing the way that world’s informal courts work on the internet, any individuals or businesses who ever feel wronged by any comments on the internet should exercise their ample opportunity and right to deny anything they believe to be untrue. We NEVER censor anyone who replies to our postings with alternative viewpoints or to deny the stories. We leave those comments on as long as the postings remain so as to ensure that both sides of every story can be told. Use the search feature on our home Facebook page to find information on particular public officials and issues. When you see information you especially like, consider becoming an education promoting patriot by sharing, emailing, photocopying and distributing educational content about PNG issues to your friends, relatives and colleagues and posting on public notice boards. If you think we’re performing a useful service on the PNG social media, please give our page a like since that way you will continue to be alerted on the latest. Spread the word to your friends of our existence and do accept our thanks!